Iceland is surely near the top of almost every photographers bucket list of places to shoot, and rightly so. The landscape here is utterly unique and offers the kind of scenes that you simply can’t witness anywhere else on earth. Glaciers and waterfalls, black pebble beaches and jagged mountain peaks, the diversity is seemingly endless and it’s the kind of trip where you can’t fail to be inspired by the epic nature of the scenery. During June the golden hour, sunset, twilight and sunrise merge into each other lasting for hours, and all the elements are in place for truly unforgettable experience. We’ve created this workshop to include Iceland’s most beautiful and iconic places and give you plenty of time there by basing ourselves at three separate locations for a couple of nights each. Our first base is on the edge of the Highlands, near the valleys of Landmannalaugar, one of Iceland’s most stunning areas with it’s orange and red rhyolite hills and volcanic lava fields. This is a truly unique part of the world with alien landscapes in every direction. We’ll also be based close to Haifoss, one of Iceland’s highest waterfalls which plunges 150 meters into a vertiginous gorge. Our second base is in the south, from where we can shoot the famous black beach at Vík and Reynisfjara, the cliffs of Dyrhólaey , the waterfalls of Skógafoss and Seljalandsfoss, and the eerie remains of the DC-3 stranded on Sólheimasandur beach. However, there’s more to the area than that and we’ll take you to lesser known waterfalls and beaches during our time here. Finally we’ll head to the southeast where the Vestrahorn’s peaks rise impossibly from the black sand beach of Stokksnes and are mirrored in the tidal lagoons. 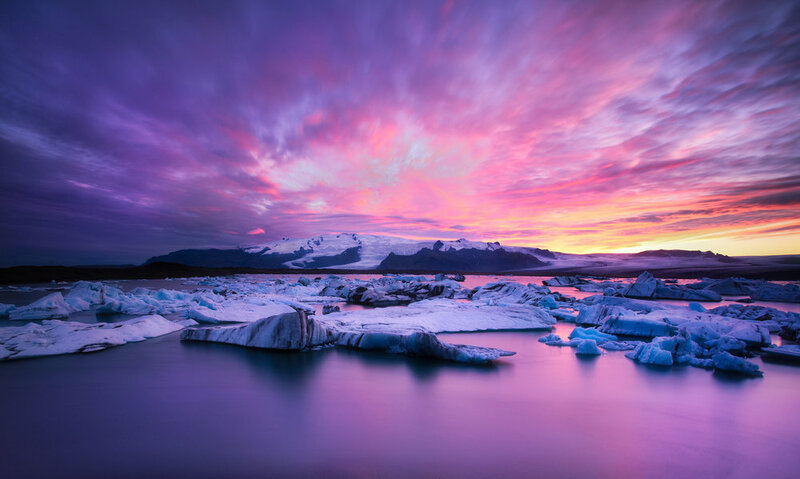 The south east is also home to Jökulsárlón, a lagoon full of icebergs which slowly drift into the sea where many are washed up on the neighbouring “Diamond beach”. Of course, we’ll also introduce you to some of the less commonly visited gems in the area. All our workshops are designed to ensure that you can focus on photography while we take care of everything else. Ideally located and comfortable accommodation as well as all your meals are all part of the package, and of course the tour is structured to maximize your opportunities to get great images whilst improving your skills as a photographer. We use all our experience and knowledge to get you to some of Iceland’s most beautiful locations in the best light, and in the field we’re on hand to provide as much support, advice or guidance as you want. Beginner, amateur, enthusiast and semi-pro photographers. We tour the country basing ourselves at three locations, and while the dates that we’ll be in the bases are fixed, our time at each is flexible so we can decide which locations to visit while we’re there depending on the local weather and conditions. We will however ensure that we visit all of the locations in each area. At this time of year the golden hour starts around 22h00 and sunset around midnight. There’s then a period of twilight and blue hour before sunrise at around 3h, so to make sure that participants get the best conditions for shooting, we’ll concentrate our shooting in one long session between around 21h30 and 3h30. Shooting at this time also means we have even the more popular locations pretty much to ourselves outside of the main tourist hours. After the shooting session has finished we’ll head back to the accommodation and sleep, and to ensure people have plenty of time to rest and stay as fresh as possible throughout the course of the workshop there won’t be anything timetabled until brunch/lunch at 13h, and then in the afternoon we’ll have post processing workshops or travel to the next location. 17h onwards we’ll welcome guests to our overnight accommodation in Reykjavik, spend some time getting to know each other, and in the evening if people aren’t too tired head into town to to shoot some of the local landmarks around town like the Harpa concert hall or the Sun Voyager. 15h - 17h30 Processing session. Another session aimed at getting the best from the images we took in last night’s shoot. We’ll be putting into practice the skills we’ve picked up with Lightroom and Photoshop. Sunset at Haifoss waterfall. A breath-taking location where the river splits and plunges into the 150m canyon in two massive falls. We might then stop off at the interesting series of waterfalls at Gjain, further down the valley from Haifoss. Twilight and the blue hour in the Landmannalaugar area discovering new compositions or re-visiting any locations we’ve shot before in different lighting conditions. Sunset at Hnausapollur crater lake, with views over the surrounding lunar-like landscape. 21h30 - 3h30 Shooting session at Stokksnes headland. The peaks of the Vestrahorn rise almost vertically out of the flat black sand beaches and there are infinite compositions and angles in this astonishing place, from reflections in the lagoon to the grass topped dunes. The location is great at sunset but is particularly beautiful at sunrise as the first light illuminates the peaks. Sunset at Jökulsarlon lagoon and the nearby beach. Sunrise at the Jökulsarlon beach. 12h After getting up and having breakfast we’ll begin our journey back to Reykjavik. We’ll stop for lunch along the way to break the journey and be on the look out for Icelandic horses so we can stop and do some portraits. 19h We’ll arrive in Reykjavik later in the afternoon, check into our hotel and have a final dinner together. In the evening there’ll be time for an informal post-processing session before we head out for a final shooting session at some of the local Reykjavik landmarks like the Hallgrímskirkja church or the Sun Voyager sculpture. The following morning (July 6), we say our goodbyes and drop people off at the airport. Our aim is to take you to beautiful locations and give you every opportunity to get great images while improving your technique over the course of the workshop. From the beginning of your time with us we’ll aim to identify your photographic level and what you’d like to focus on, and attempt to tailor the workshop to your precise needs and provide each participant with plenty of one-to-one tuition both in the field and in the post processing sessions. We’ve carefully timetabled this workshop to ensure that while you get to experience some the most beautiful locations the country has to offer, you won’t have to sacrifice comfort or sleep despite the fact that we’ll be travelling at a time when there’s no night. We’ll make sure that you get plenty of time in the field when the light is at it’s absolute best and when there are few tourists around, and with long sessions you’ll quickly get into a shooting rhythm where you can put into practice new skills as they are learned. The dates of our workshops are carefully selected to try and make sure we are in each location at the time of year when conditions for photography are at their best. Late June/early July gives us the best chance of good weather and also gives us the opportunity to experience the long hours of golden light, sunset, twilight and then sunrise which northern latitudes experience at this time of year. Having a number of fantastic locations all very close to each of our three bases means we can adapt to the weather and go to where the conditions are best for shooting. Also, having three bases from which we can access these locations means we spend less time checking into and out of accommodation and avoids the stress of constantly moving on to a new hotel every day. This adaptability also extends to the post processing sessions. We believe that editing is an integral part of getting the absolute best out of an image but we understand that the range of participant’s skill levels and familiarity with post processing techniques varies greatly. Because of this we make the most of having small groups to provide 1-to-1 editing sessions in the afternoon that are tailored to each participant's skill levels, and which can potentially range from the basics of editing a RAW file in programs like Lightroom to more complex techniques like using layers and luminosity masks in Photoshop. Finally, we want to share with you our passion for nature and landscape photography in this incredible place. We aim to make your experience here in the beautiful landscape of Iceland a memorable one and a trip from which, as well as getting some great images from amazing locations, you’ll also go home having had a true adventure with great company in a very special place. For some of the locations a wide angle lens really is essential if you want to get those epic landscapes with a foreground that feels you can almost step right into it. 16mm or 17mm on a full frame camera (10mm or 12mm on an APS-C sensor camera) is ideal. In the highlands we’ll often find ourselves shooting distant landscapes or abstracts, which a telephoto is ideal for. A telephoto also compresses the landscape and is great for mountains when shooting from elevation. A range that covers 70-200mm (55-135mm on a crop sensor) is ideal. While these lenses are often the least useful for shooting landscapes, for the kind of locations we’ll be encountering in Iceland there will certainly be many occasions when the zooms listed above are too wide or too long and a mid-range zoom in the 24-70mm (18-55mm on a crop sensor) is perfect. We’ll often be shooting in low light so a tripod is an absolutely essential piece of equipment. A lightweight carbon fibre model is ideal for this kind of trip. We’ll be shooting at least a couple of waterfalls and a neutral density filter of at least 3 stops will help slow down the exposure to blur the water. There may also be times when a graduated filter will help control the brightness of the sky. This allows us to trip the camera shutter without touching the camera, avoiding movement blur during longer exposures. We’ll certainly be walking over rocky and uneven ground, as well as some scrambles up the side of hills. We’ll also often find ourselves in muddy conditions so warm boots with good support and grip are essential. Even though it’s summer it can still get quite chilly in Iceland so warm clothes will help keep you comfortable while we’re out shooting. It’s best to layer, with a base layer next to the skin and then a fleece or thicker layer on top. An insulated jacket on top of that will keep you warm, and also a waterproof or windproof shell as a final layer in case the weather turns bad.. When moving your camera gear for any length of time a backpack can really save your back. A good backpack, one with sturdy hip straps, can safely distribute the weight of your gear and really save you from aches, pains and potential injury. ANDY MUMFORD is a Lisbon based professional landscape and travel photographer. Andy grew up in the UK loving nature and travel and took up landscape photography over a decade ago. Since then he has travelled extensively photographing all over the world and his photography and articles have featured in publications and books worldwide. He is a passionate photographer teacher and has been leading both group and one-to-one workshops for six years. To register for the workshop we require a €900 deposit. Please complete the form below for more information, or for any other questions you have about the workshop.